We’ve picked up several new subscribers as a result of our recent promotion. As a reminder, Casefile Clues is sent as a PDF file attached to an email. Issues are for personal use only and not to be forwarded, shared, etc. We try and keep subscription rates as low as possible and we appreciate those who help us out by not sharing. Newsletters are named in a similar fashion: casefile_clues_x_y.pdf where x is the volume number and y is the specific issue number. Some subscribers find it helpful to put them in a separate folder–but the names make it easy to see if you happen to be missing an issue. Issues are sent from either mjnrootdig@gmail.com or michael.john.neill@gmail.com. Issues usually go out on the weekend, but there is some variability in that schedule. I always post to this blog when an issue goes out. Sometimes messages get bounced back because email boxes are full, temporary errors, etc. If you see that an issue has been sent and you don’t have it, please let me know. This entry was posted in Uncategorized on July 31, 2018 by mjnrootdig. Those who do not wish to use PayPal or a credit card, may print out our subscription form and mail their payment. Your email address is required on the form as issues of Casefile Clues are sent via email. 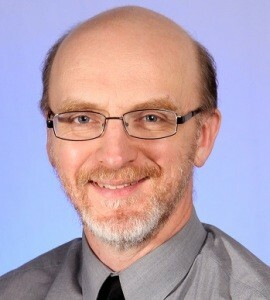 Questions should be sent to Michael at mjnrootdig@gmail.com. This entry was posted in Uncategorized on July 28, 2018 by mjnrootdig. Probably one of the best genealogical records to use are affidavits, depositions, and other similar “official” statements made in pension claims, court cases, etc. While these statements are usually focused on the issues involved in the court case or the pension application, they can contain seemingly extraneous details that are genealogically significant. As we’ve mentioned elsewhere, additional about the individuals involved may not be mentioned if they are not considered germane to the issue at hand. These “off the cuff” items mentioned in affidavits, depositions and the like are one reason that researching the entire family and social network is so important. An 1860 statement in a pension file may indicate that the affiant remembers the date because it was the year his cousin (whom he names) broke his leg. Depending up on what you know (or don’t), that reference could be significant. This entry was posted in Uncategorized on July 27, 2018 by mjnrootdig. 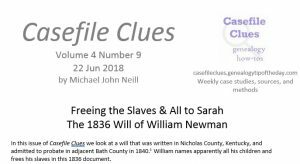 We’re excited that Casefile Clues is back up and running. Writing is a great way to improve your research (speaking just for me) and reading about records, analysis, interpretation, and methodology is great for readers. Subscribe by 30 July and we’ll send 12 issues for free. Subscriptions normally start with the next issue, but we’ll send the first 12 issues of volume 4 with our compliments for subscriptions that are ordered by 30 July. Casefile Clues strives to be readable, clearly written, practical, and down-to-earth. Find out more on our website. Issue 4-12 has been mailed. If you are a subscriber and you do not have it, please let me know. This entry was posted in Uncategorized on July 26, 2018 by mjnrootdig. We’re wrapping the final edit of the next issue. It looks at a statement made in 1881 by the sixty-two year old daughter of a War of 1812 widow who was supposedly ninety-two years old. 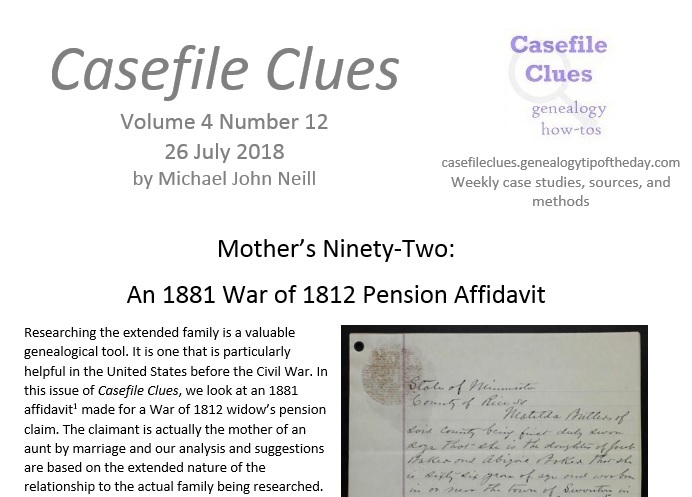 Casefile Clues-PDF Newsletter-(usually weekly how-to newsletter on document analysis, methodology, and more–grow your research skills–it’s easy to understand, cited, )-$20 for 52 issues. Consider subscribing to the Michael’s Weekly Blog Update or to Casefile Clues. We try and keep the prices affordable and easy on the budget. There’s not a better genealogical education budget than Casefile Clues. It’s easy-to-read, straight-forward, and not full of overly pretentious academic prose written to appeal to an editor or reviewer. This entry was posted in Uncategorized on July 19, 2018 by mjnrootdig. Virtually every document a genealogist uses was created for a non-genealogical purpose. Never hurts to remember that. This entry was posted in Uncategorized on July 18, 2018 by mjnrootdig. One thing I try and discuss in every article is the goals of the specific research that lead to the record being discussed. Regular readers know that many issues of Casefile Clues focuses on analyzing one specific document. We usually analyze that document in isolation–not because research is in isolation, but because it often helps us to focus on as many details in that one document as possible without bringing in “other information” that may cloud what the documet says. Of course, later we need to put together all the documents we’ve found and see what general conclusions are supported from those documents. Our analysis of individual documents is usually completed with a discussion of what the research goals are, why/how this document was located, and what the most reasonable next steps are moving forward. But the goals do matter and while we encourage exhaustive research and “locating everything,” we try and balance that with practicality, access to records, and cost of obtaining records. Visit this link–hit “check out with PayPal” (you won’t be charged nor asked for a credit card) and enter your email address on the next page. It’s that easy. We are looking forward to returning to our research, analysis and discussion of records. And, yes, we are even looking forward to returning to citations. We’ve got stories on some old favorites, follow ups to a few missing links, and new families and locations to discuss. We are excited about what’s coming up in the newsletter. This entry was posted in Uncategorized on July 17, 2018 by mjnrootdig.